San Francisco’s diversity still amazes me. I think you can pretty much buy anything in the city. Just the other day, Dennis and I were on a quest for a certain Peruvian spice. Our dear friend Manuel made us this really tasty classic Peruvian chicken dish called Aji de Gallina. We loved it so much that we wanted to try to make it ourselves. Manuel generously gave us the recipe which calls for chicken breast, walnuts, parmesan cheese, evaporated milk and this chili paste from Peru called Aji paste. Manuel warned us that most grocery stores don’t carry the chili paste and we can only buy it from this Latin American grocery store in the Mission. So off to the Mission we went. We found ourselves at Casa Lucas Market on 24th between Alabama and Florida. We knew we were in the right place when we saw the big pile of ripe plantains sitting outside the store. 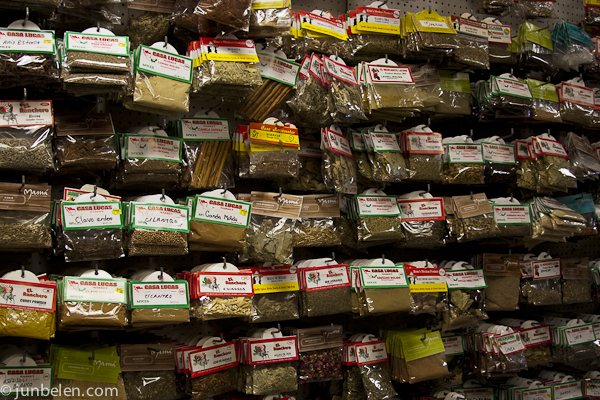 What caught my eye was this huge wall of spices in one corner of the store. And these were not spices packaged in fancy glass containers but these were spices wrapped in plastic bags with handwritten labels, from cilantro to cinnamon sticks. And lo and behold, Dennis found the elusive Aji paste in the Peruvian aisle. Casa Lucas had a dedicated aisle for all things Peruvian. It was amazing. Equally amazing was Dennis’ own take on Aji de Gallina that evening. It was very tasty.